I'm trying to set a good example for those of you who are participating in my QAL (read about it here) so last night I made this quilt top! I used my one and ONLY piece of Heather Ross beach scene fabric. This is an example of how you can use your fabric without even cutting it! I designed the quilt around the dimensions of the piece I had. I used three shades of Kona blues, Kona tans/creams, tangerine and white to create the top. I even have my precious Heather Ross blue, orange, and brown dot fabric all ready to cut for binding! How are you all coming along? Have you decided what fabric to cut? Are you getting cold feet? Oh, and Elizabeth of Don't Call Me Betsy tagged me in a getting-to-know-you sort of post so here are my answers! 1. Do you have other hobbies other than quilting? Reading and cooking. I prefer actual books to anything on a Kindle or e-reader. Sometimes I checkout audio books from the library and listen to them while I quilt. Also, I cook, I don't bake. I hate the precision of baking (pretty much the exact opposite of Elizabeth's answer to this question!) I like to experiment and, frankly, if I learned how to bake well I'd weigh a thousand pounds! 2. 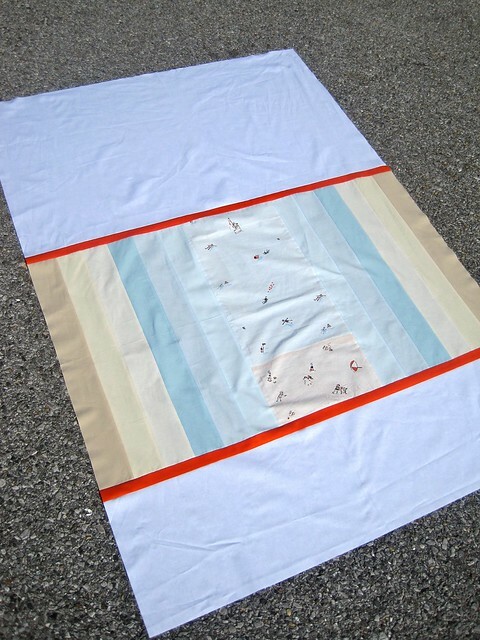 What's the smallest size scrap you save when quilting? 3. How many of your quilts do you actually own? Six. Two couch blankets for myself, one t-shirt quilt of my hubby's, a Christmas quilt, one quilt for our bed, and one small quilt I made for my oldest son. It's not a lot compared to how many I make, but the joy is in the process for me, not in the keeping. It makes me sad to see stacks of quilts in closets that go unused. What's the point? Why not sell them or give them to someone who will use them? Just my opinion. 4. 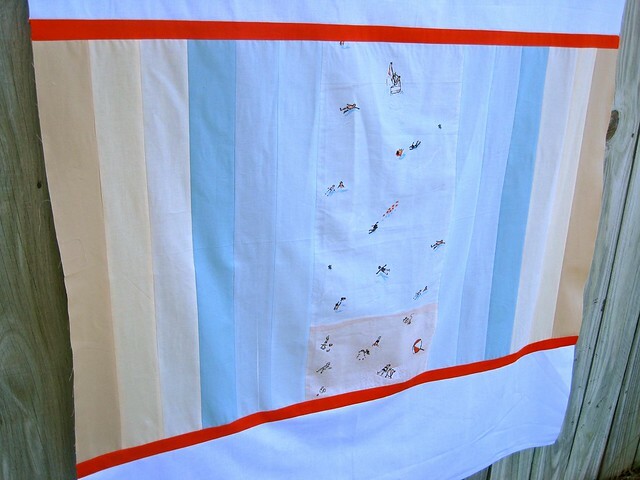 Are you a pre-washer, or do you wash your fabrics after the quilt is finished? I only prewash flannel or if I'm making clothes. 5. What do you do while you sew? Listen to music? Watch TV? Enjoy the silence? I listen to music or audio books, always! 6. How many blogs do you read? uh, too many to count! I think this is a perfect little boy quilt Kelly! Is one of your boys going to be lucky enough to get this? I have my FFA all pressed and hanging on my design wall. I need to measure it to make sure I have enough...and if not, start begging people to share. ;) But in the words of Tim Gunn, I'm going to "Make it work"! Oh that is a pretty quilt! You cook? I 'heat up'! I really like the pop of orange! I kind of got cold feet on this project. I thought about those Full Moon Forest fat quarter bundles, but basically I have three daughters and might have one more baby, so I want to wait until I'm sure if I might have one more daughter or not before I use it. I want to make them all coordinating quilts from it. 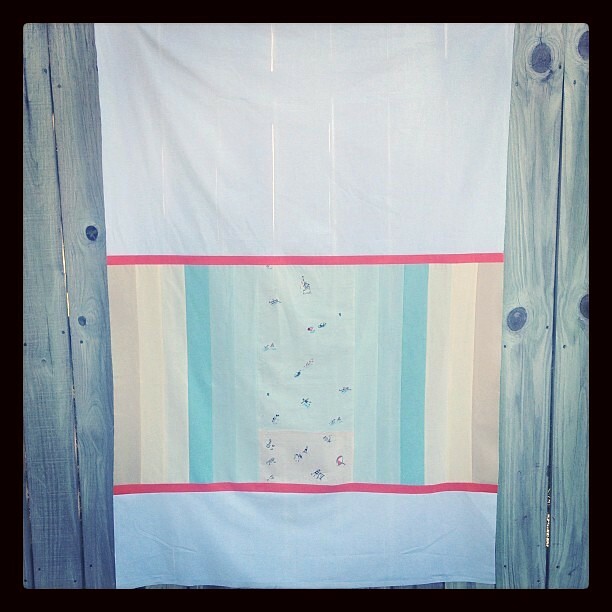 I made a quilt top out of my Hello Pilgrim butterflies and some of my Denyse Schmidt stash. I read that she has a new line coming out in the end of the summer or early fall and I need to make room for it, so I need to use up some of the fabric I've been hording. I basically have at least a yard of every fabric from Hope Valley to all the DS Quilts lines to the newest FMF. I also used one of the first pieces of fabric I'd ever bought when I first started sewing about 4 years ago for the backing. About the cold feet--I've already ordered replacement Hello Pilgrim butterflies so I never run out. Love the pastel colour wash look of the quilt top! Lovely! I almost yelled out - Oh No, not a whole piece of the beach?! Great job, your bravery may have pushed me to join in. Oh it's soooo pretty. It's going to look great quilted, too! Good example, indeed!! It looks fab! you're such a good leader... it's a great design too. i never prewash unless i am using flannel or making clothes also! i love this little quilt! very cute design kelly! are you going to keep it?